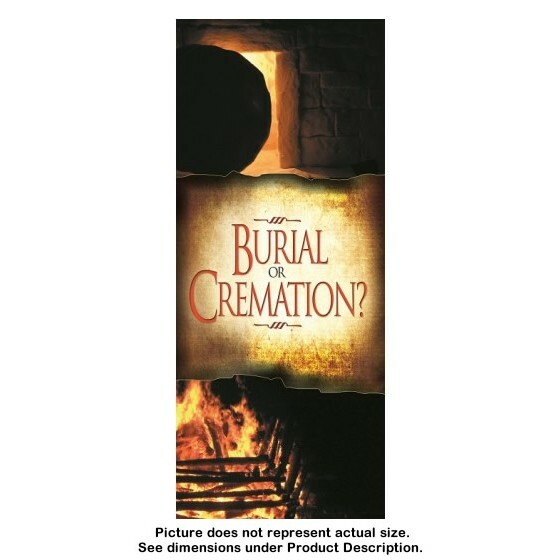 The practice of cremation is rarely discussed publicly within the Church, although this alternative to burial has become a modern-day phenomenon. More and more people have chosen to have their remains cremated; therefore, the issue must be dealt with regardless of its sensitive nature. We will consider the differences between burial and cremation in this short examination, and use the Bible as our only reliable source. First, I must point out that the method in which a person chooses to dispose of his or her body at death has no direct relationship to their salvation. Nor am I questioning God’s ability to raise the dead from dust or from ashes. I am, however, obligated to challenge believers to examine what Scripture says regarding the biblical ordination for disposing of a person’s body. We read on several occasions in Scripture that fire came down from heaven as a form of judgment to destroy the opposition (Genesis 19:24; Exodus 9:23; Leviticus 10:2; Numbers 11:1, 16:35). God threatened the godless people with fiery judgment (Jeremiah 17:27; Hosea 8:14; Amos 7:4). When Israel fell into idolatry, the people used fire to sacrifice their sons and daughters to the demon god Molech (Deuteronomy 12:31; 2 Kings 16:3, 17:17, 21:6, 23:10; Ezekiel 20:31). These examples provide evidence that Scripture does not endorse cremation of the body. We can begin with Abraham, the father of all believers, and follow the accounts of each person mentioned in Scripture thereafter, and will not find one who was deliberately burned after they died. King David, a man according to the heart of God, died and was buried: “So David slept with his fathers, and was buried in the city of David” (1 Kings 2:10). In the New Testament, we read about the way in which John the Baptist’s body was handled: “And his disciples came, and took up the body, and buried it, and went and told Jesus” (Matthew 14:12). Jesus prophesied about His burial after an unnamed woman poured precious ointment upon His head, “She hath done what she could: she is come aforehand to anoint my body to the burying” (Mark 14:8). Jesus was not cremated when He died, “And when Joseph had taken the body, he wrapped it in a clean linen cloth, and laid it in his own new tomb, which he had hewn out in the rock: and he rolled a great stone to the door of the sepulchre, and departed” (Matthew 27:59-60). About the first Christian martyr, we read: “And devout men carried Stephen to his burial, and made great lamentation over him” (Acts 8:2). The Apostle Paul asked: “What? know ye not that your body is the temple of the Holy Ghost which is in you, which ye have of God, and ye are not your own? For ye are bought with a price: therefore glorify God in your body, and in your spirit, which are God’s” (1 Corinthians 6:19-20). When we understand that our bodies are not our own, we will immediately understand the significance of burying the body. In Scripture our bodies are referred to as seed. Seed should not be burned, but buried: “And that which thou sowest, thou sowest not that body that shall be, but bare grain, it may chance of wheat, or of some other grain” (1 Corinthians 15:37). We may not be able to scientifically or intellectually identify what is contained in this seed, but it is clear that this body/seed must be placed in the ground in order for it to bring forth the spiritual body: “It is sown a natural body; it is raised a spiritual body. There is a natural body, and there is a spiritual body” (1 Corinthians 15:44). Would anybody think to burn a seed, then plant it in the ground and expect a harvest? Burial is the method God has instructed His people to use when disposing of a body. It should come as no surprise that cremation was practiced only by members of pagan religions. Hinduism and Buddhism are just two of many other Far Eastern religions that are spreading like wildfire throughout the Western world. Yoga is now an accepted form of “exercise” among Bible-believing evangelicals! I was surprised during a recent trip to the mall to find an entire section of Hindu and Buddhist religious paraphernalia for sale. Pagan religions are alive and well, even in the middle of what has popularly been labeled as the Bible Belt. This is part of the progress of Bible prophecy fulfillment. Revelation 13:8 says, “And all that dwell upon the earth shall worship him [the image of the beast].” Therefore, it stands to reason that all religions must eventually unite in order to fulfill this Scripture. Thus, the difference between Christian and pagan burials will cease to exist. Naturally, there is nothing we can do about those who have already been cremated, but the point of this writing is to dissuade any believer who has intentions to be cremated by documenting from Scripture that cremation is not a biblical practice. Furthermore, the manner in which a body is disposed of must be important, because the Bible records the conversation that took place between Michael the archangel and Satan about the body of Moses (Jude 9). A number of arguments, including the cost of the procedure, may seem to support cremation, but Bible-believing Christians should reject this practice and consider it as an abomination to God and a rebellion against His designed plan for mankind. There is no need to consider those who were burned at the stake for their faith, or others who were forcefully robbed of their bodies, because Jesus said: “God is able of these stones to raise up children unto Abraham” (Matthew 3:9). Did God not miraculously save His three faithful servants from Nebuchadnezzar’s burning furnace (Daniel 3:19-27; Isaiah 43:2)? The same applies to people who are killed in fires and explosions, and to those who accidentally were consumed by corrosive acids. It also applies to those who were burned in ovens during the Nazi time or were destroyed by fire during Communist actions. God can restore the resurrection body to all these people. But to be voluntarily cremated is a clear violation against the body which is not our own: “What? know ye not that your body is the temple of the Holy Ghost which is in you, which ye have of God, and ye are not your own?” (1 Corinthians 6:19). Anyone who gives his body for cremation is not a martyr. He is committing an outrage and is desecrating the body entrusted to him by God. Take warning regarding cremation, which is of the devil! I refuse to accept the argument that there is no longer space enough to bury the dead. The Lord said, “Replenish the earth” (Genesis 1:28). The earth is far from being filled with living people—is there then not enough space for the bodies of the saints who have died?